Join the fun for great causes! 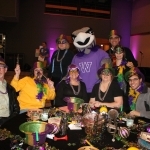 On February 22, 2019 in UW-Whitewater’s University Center, the UW-Whitewater/Community Optimist Club and the UW-Whitewater Student Optimist Club will host the 6th Annual Optimist Trivia Night. Doors will open at 6pm, and the trivia competition will begin at 7pm in the Hamilton Room. Heavy hors d’oeuvres, a cash bar and free child care will be provided. All the proceeds from the event will be contributed to projects in the local community, including a positive messaging campaign at Whitewater High School, support to the Whitewater Food Pantry and the UW-W Campus Food Pantry, a hydroponics project at a school in Milwaukee, support to the Whitewater Unified School District Family Emergency Fund, and other youth projects sponsored by the two Optimist clubs. Trivia teams will consist of eight members for $150; you may add two more members for an additional $25 each. The night will offer ten rounds of trivia, individual trivia, silent auction and bucket raffle, costume contest, cash drawings, prize wheel, and lots of entertainment. The two top trivia teams will be awarded a prize at the end of the night, and other prizes will be given out throughout the event. There will be many ways to win prizes, including for best costume, most spirit, and funniest answers.